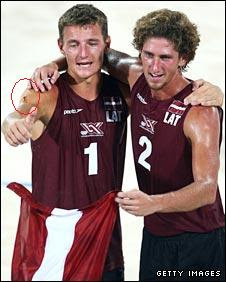 What is that black tattoo on Kerri Walsh's right shoulder? It is called Kinesio Tex Taping which is an elastic taping used in chiropractic, rehabilitation and sports medicine. Developed 25 years ago by Dr. Kenzo Kase, it is now getting recognition and being used by top athletes such as Lance Armstrong, Serena Williams, David Beckam, Robby Ginepri and Justine Henin. Kinesio Tape works by giving support like a flexible brace and facilitates weak muscles with neurological awareness or proprioception. Kerri Walsh had a recent rotator cuff surgery last November. NBC reported that she uses the black shoulder tape for better circulation and her shoulder pain. Harder to see with the beige Kinesio Taping, Martins Plavins used Kinesio Taping in the huge upset against the US team of Todd Rogers and Phil Dalhausser. Did Kinesio Tape give Walsh and Plavins an unfair advantage to both win? :) Maybe not, but it pleases me to know that I something I use to help my patients is trusted by top athletes.